Wonderful atlas map of Alaska soon after it was ceded to the United States by Russia. Northwesterb America Showing the Territory Ceded by Russia to the United States. 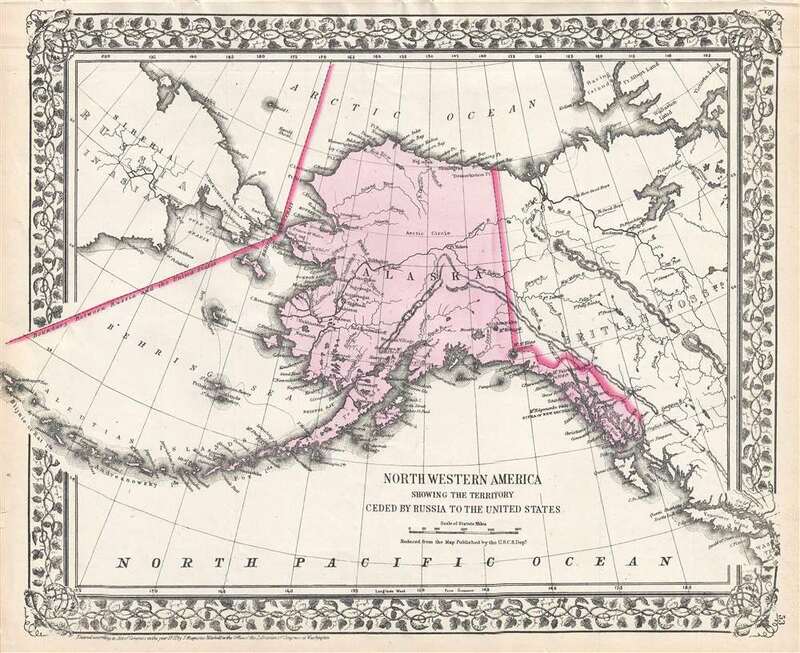 This is an 1872 Samuel Augustus Mitchell Jr. map of Alaska. The map depicts the entire state of Alaska, along with eastern Siberia across the Bering Strait from Alaska, western Canada, and the Pacific coast of North America as far south as Vancouver Island and the Washington Territory. Numerous towns and villages are labeled in Alaska, as are several forts in the Yukon Territory and British Columbia. Islands are identified throughout, including the individual islands in the Aluetians. The whole is surrounded by the vine motif border that was characteristic of Mitchell maps between 1865-1880. This map was created by S.A Mitchell, Jr. and issued in the 1872 edition of Mitchell's New General Atlas.